I woke up not quite Christmas-morning excited, but energized nonetheless. Nervous too. This would be my second time riding the trailer, the first time being the night before when I rode 6 blocks to a friend’s house to return some hand-me-down clothes. But the day dawned clear, Helen was excited, and before long, off we went. 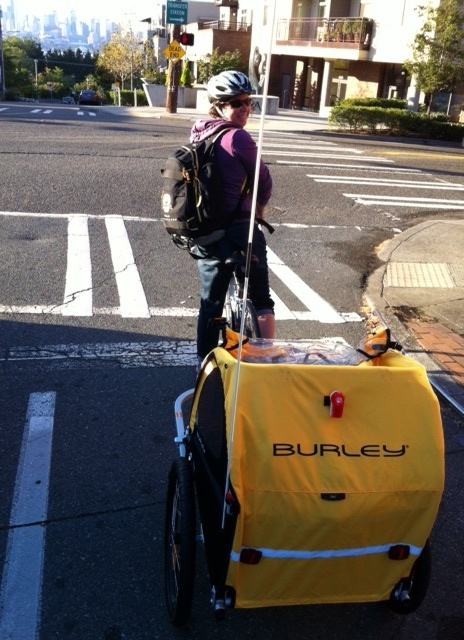 Wiley escorted us ¾ of the way to preschool, and a fellow rider wished me luck as he passed. Smooth sailing so far. My plan got complicated after dropping Helen off. First stop, a bike rack across the bridge in Fremont, where I would lock the trailer up for the day. I rode around near the bike path looking for a good spot to stash the trailer. Some empty bike rack, maybe next to an office building? I spotted four small racks, all empty, outside of a gym. Perfect. Only not so much. As I was locking it up, a woman who may or may not have worked at the gym told me I (as a non-member) needed to find a different rack. “This is private property” she said. I think that’s a lie. The sidewalk outside of a business is private property? Since when? I was flustered, and pissed. I felt the way I did when I tried to take a friend’s dog for a walk on Whidbey Island and we got kicked of the beach. But I moved my bike. There was a lovely rack right around the corner from the gym. All of this took a long time, the unhitching of the trailer, the locking and unlocking and re-locking of trailer, and bike, and finding a new rack. But then I was off again, for my big hill climb of the day, to the Greenwood neighborhood. People from Seattle are always surprised at how hilly our city actually is. I’ve consulted with bike commuter friends about the best streets to take to various destinations. But if you’re going from one neighborhood to another, chances are you have to ride up a hill. I arrived in time to do a little emailing at a café and let the sweat marks dry before meeting up with my carpool. Oh, didn’t I tell you? For the next five weeks, I’m a writing tutor in a 7th Grade classroom. In Burien, about 15 miles from my house. So my Monday workout is to ride up to the carpool departure spot, the headquarters of 826 Seattle, a writing center for kids. I’m excited that I get to volunteer with 826 after a three-year absence (grad school, babies), and in my old Burien stomping grounds no less. Post-tutoring, I rode to Ballard to meet some friends for tea and to do a bit (a very little bit) of work. The babysitter was home with the kids by now, and around 6 I left for a pleasant evening ride to Fremont. Bike trailer back on the bike, and then I rode home. Partway up the hill to my house someone came alongside me, singing a children’s song off-key. Wiley, on his ride home from work. We concluded our commutes together, me huffing up the hill even though the bike trailer was empty. 12 miles on Day 1. More hills than my usual exercise rides. A good day.